Focus Stacking: this combines 8 shots into a single image from a single shutter release. Focus Bracketing: a series of shots are taken at different focus distances so that you can choose the most successful later. Advanced Focus Peaking: better manual focus display. Silent Mode: uses the camera's electronic shutter for silent stills and video photography. S-OVF (Simulated OVF): more natural-looking 'optical' viewfinder image. Movie image stabilisation with 5-axis optical IS and digital IS: the digital stabilization is new. 24p (23.98p)/25p Frame Rate: offers a choice of frame rates rather than just 30fps. Movie Info Display: includes histogram, level gauge, audio level, time code. Slate Tone: automatically matches in-camera audio wavelengths with the OLYMPUS LS-100 audio recorder. 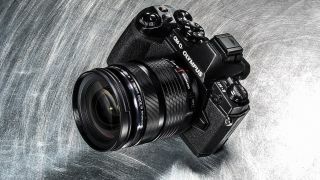 Olympus says the emphasis is on video and professional workflow and the key updates are the focus stacking mode, extra video frame rates, digital stabilization, enhanced movie info display and silent mode. Focus Bracketing: the camera shoots a series of images at different focus distances so that you can choose the best one later. Advanced Olympus Capture tethered shooting software compatibility. 4K Time Lapse Movie: shoots 4K stills at fixed intervals for combining into a 4K movie. Movie-Exclusive Picture Mode: Flat/Noise Filter for video shooting: this captures footage optimised for color grading later. The key additions for the E-M5 II are the 'flat' movie mode and the focus bracketing option. The updates for both cameras are available from November 26th and can be installed via the Olympus Digital Camera Updater app.